Our local wildlife is doing it tough! Would you like to do more to help our little buddies in the backyard? Here's some ideas which may make your backyard a haven for our native wildlife. THE THRILL OF THE CHASE CAN BE DEADLY!! Myopathy in wallabies, pademelons and kangaroos happens when the animal is under extreme stress, such as being attacked or chased by a dog. She does not have to be injured directly to develop rhabdomyolysis (disintegration of the muscle fibres). From within 24 hours up to a few weeks after the incident, the animal will show stiffness and hindquarter paralysis, progressing to complete paralysis. She will be distressed and anxious and salivate excessively. She will die 2-14 days after the stressful incident. We usually think that if our pet did not actually attack the wallaby, all is well, our dog has had exercise, the wallaby got away. Now you know – the wallaby may have gotten away, but it did not necessarily escape a painful and slow death. It is avoidable, just by restraining your dog. Provide a birdbath in a place that is safe from cats and other predators. This should to be cleaned regularly and be shallow, or have twigs inside so that the birds can easily climb out. Provide a pond which will provide habitat for frogs and water for smaller animals. Ensure that there is an easy exit point should a small animal fall in. Add some rocks to enable small animals to climb out over the side. There are a range of mammal species and birds that require hollows as part of their habitat. Some use the hollows for nesting and some use hollows for shelter. 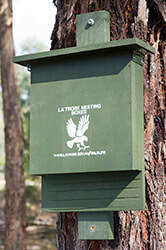 Installing a range of nesting boxes, with different dimensions and features, ensures that a variety of mammals or birds have the appropriate 'hollow' to meet their needs. You can google to find your own online sites which offer instructions on how to construct or purchase a particular nesting box. You can make your garden a happy place for our Whitsundays wildlife. Smaller wild things like bugs, butterflies, wrens, micro-bats and lizards need small places to hide and nest in, like shrubs, logs and rock piles. Adding some more natural areas to our gardens can help them live happily alongside the big guys and can mean even less garden maintenance too! Birds and animals use plants for many things including; food, shelter and breeding sites, so plants don’t necessarily have to provide food directly as they may attract insects which in turn provide food for some species. Do not using chemicals for pest and weed control. Plant locals: Plants that grow naturally in your area are suited to local conditions. They will provide the correct food and shelter for our native birds and are less likely to become weeds in adjacent bushland areas. If you can't get Whitsunday native plants, general natives are the next best thing. Plants which provide food: Small birds eat nectar from native flowers and seed from native grasses, as well as insects. Mulch your garden to encourage insects. Choose plants like eucalyptus and lemon scented gums that provide food for possums as well as providing food for flying-foxes in the form of nectar and pollen. ​Create diversity: Small birds use ground covers, grasses, small, medium and large shrubs. Plant below trees: A dense understorey is enjoyed by small birds. Plant for changing seasons: Different plants will flower and fruit at different times of the year. Ensure there is always food sources available in your garden by looking at the flowering and fruiting times of potential plants. Reduce lawn area: Replace unused lawn areas with garden beds or native grasses which produce attractive seed heads that provide food for finches and other seedeaters such as Crimson Rosellas. Use small gardens effectively: With limited space, it is better to plant several plants of the same type, than only one of several types of different plants. Provide large rocks for habitat for lizards. Leave leaf litter in your garden to attract insects and lizards and leave safe dead trees and hollowed limbs of live trees in your garden as nesting sites for birds. Encourage your neighbours to also provide habitat to help out our wildlife. E.populnea Poplar Box **(Koalas love the flowers & buds ) Grows around Nebo area. Be a responsible pet owner and keep your dogs and cats supervised. Restrict the use of pesticides, fungicides and herbicides on your property. Wildlife can be poisoned by chemicals. Teach your children to respect and appreciate our wildlife. Retain and plant native vegetation on your property. These provide food, shelter, nesting sites and safety. Tree hollows are very important. To prevent wildlife drowning in pools and ponds attach a thick rope securely outside the pool and put the other end of the rope in the water to help animals climb out safely. Instead of feeding wildlife - plant food trees for them. If you must feed them - give them a small amount of their natural diet on an irregular basis. In the dry months supply fresh water in a safe place, away from cats and predators. Drive slowly and carefully, especially at dusk, dawn and night. If you find an injured animal please stop to render assistance if safe to do so. Carry a rescue kit in a box in your car (blanket, towel, pillowcase, scissors and safety pin). Always check the pouch of dead marsupials. If you find orphaned or injured babies place them in a pillowcase and keep them warm. Never relocate an animal out of it's natural area - many are very territorial. In all cases of animal rescue please ensure your own safety when rescuing. PLEASE keep all DOMESTIC PETS and YOUNG CHILDREN away from a sick, injured or orphaned animal or bird.